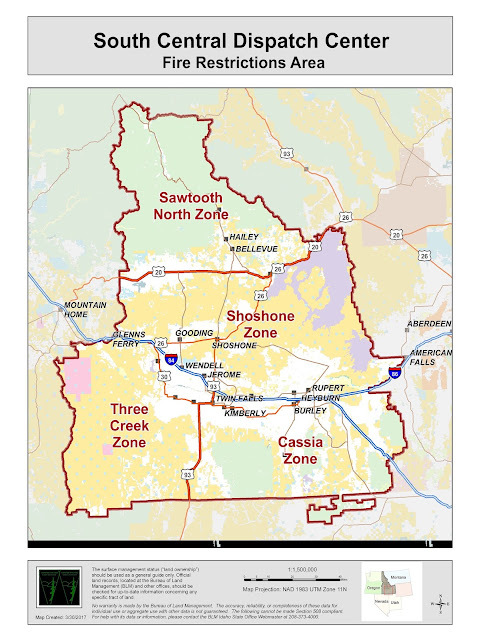 SHOSHONE, Idaho-- As the threat of wildfire danger continues to increase, state and federal land management agencies will implement Stage 1 Fire Restrictions on lands within south central Idaho effective August 3, 2018 at 12:01 a.m. Fire restrictions are intended to decrease the chance of any preventable fires in the designated areas. Stage 1 fire restrictions will be in place on federal, state and private forest and rangelands, roads, and trails, situated in Blaine, Camas, Cassia, Custer, Elmore, Gooding, Jerome, Lincoln, Minidoka, Owyhee, and Twin Falls counties. All Sawtooth National Forest, Twin Falls District BLM, and Idaho State lands north of Highway 20 to the northern most Sawtooth National Forest boundary. From Hill City east to the Craters of the Moon National Monument and Reserve Visitor Center. All Twin Falls District BLM and Idaho State lands from I-84/I-86 south to Idaho/Utah/Nevada border. East of Highway 93 to the Cassia County/Oneida County line. All lands administered by the Minidoka Ranger District, Sawtooth National Forest. · Building, maintaining, attending, or using a fire, campfire or stove fire except within a designated recreation site and in a permanent concrete or metal fire ring, or on private land, and only within an owner-provided structure. · Smoking, except within an enclosed vehicle, building, or designated recreation site, or while stopped in an area at least three feet in diameter that is barren or cleared of all flammable materials. With the fire season well underway, these restrictions are intended to keep visitors to public lands safe as well as prevent dangerous and damaging wildfires. If you are planning a visit to public lands in these areas, please check with the Sawtooth Ranger District offices https://www.fs.usda.gov/sawtooth, the BLM Twin Falls District BLM https://www.blm.gov/idaho or the Idaho Department of Lands for the latest information.